Andrew Estcourt, Laurie Poile, Steven Bedggood (Handicap winner), Mick Ward (Champion of Champions), Justin Broderick (his first competition sash), Megan Boast, Peter Shahin, Ian Findlay (Community Bank Cup winner), John Wood (President), Jodie Stockdale. Ian Hill (High Gun) at front. Grey skies but no rain greeted the shooters at the Woods Point Gun Club for the Community Bank Cup competition. Dark shadows made the targets thrown to the left difficult to see but by about noon the light conditions had evened up. The Eye Opener, 10 targets Single Barrel resulted in Rob Bevis winning AA Grade, 10/10, the only perfect score. Andrew Estcourt’s 9/10 won him the A Grade cash with Geoff Hill taking B Grade, 9/10. Jodie Stockdale started well by winning C Grade. 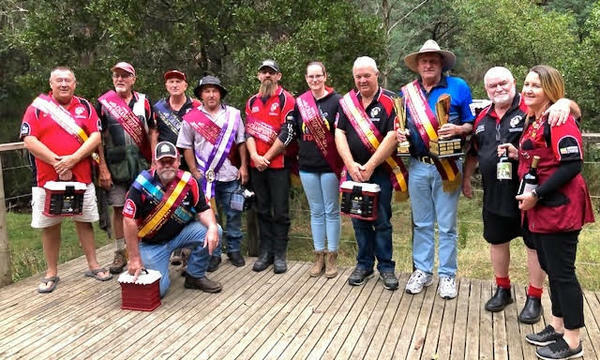 The main event was the 60 target Community Bank Cup comprising 15 targets each of Single Barrel, Double Barrel, Double Barrel Points decision and Continental, all shot from the 18 metre mark handicap with a potential score of 90/90. No one managed the perfect 15/15 in the Single Barrel but Geoff Hill and Laurie Poile returned solid 14/15’s to be in the lead. The Double Barrel brought Peter West, Phillip Desmond, Ian Findlay and Shawn Wood into contention with 15/15 each, another seven shooters on 14/15. The Double Barrel Points decision where a first barrel break was awarded 3 points, a second barrel break 2 points and a miss 0 points, was a real deal breaker. Findlay was the one to beat with 44/45, Hill hot on his heels 43/45. 15 targets Continental finished the event with no perfect 15/15. Allan Kidd, Phillip Desmond and Shawn wood returned 14/15 each with six more on 13/15. After a final score tally Ian Findlay was the holder of the 2019 Community Bank Gold Cup with 82/90. In the Grades Findlay took AA 1st, Mick Ward 2nd, 103/115, after a shoot off with Desmond and Hill. Andrew Estcourt’s 80/90 was enough for A Grade, Megan Boast 2nd, 70/90. Hill won B Grade, 80/90, Poile 2nd 77/90 while in C Grade Peter Shahin shone, 71/90, Justin Broderick in 2nd place 54/90. In conjunction with this event the club’s Champion of Champions event was held for all shooters that had won an Overall win or a High Gun in the 2018 competitions. Mick Ward was the proud winner of the sash within a final score of 103/115. The final event was the Community Bank Handicap Championship that resulted in Steven Bedggod from 17 metres saving his best for last by returning 25/26 after a shoot off with Allan Kidd 2nd, 25/27, and Peter Lang 3rd, 24/27. Fourth place required a shoot off between Shawn Wood, Geoff Hill and Daryl Ewert with Hill taking the prize 22/24. Bedggood was delighted to also win another metre to his handicap. The Overall Community Bank High Gun for the day was a surprised Geoff Hill returning 107/120.